1. 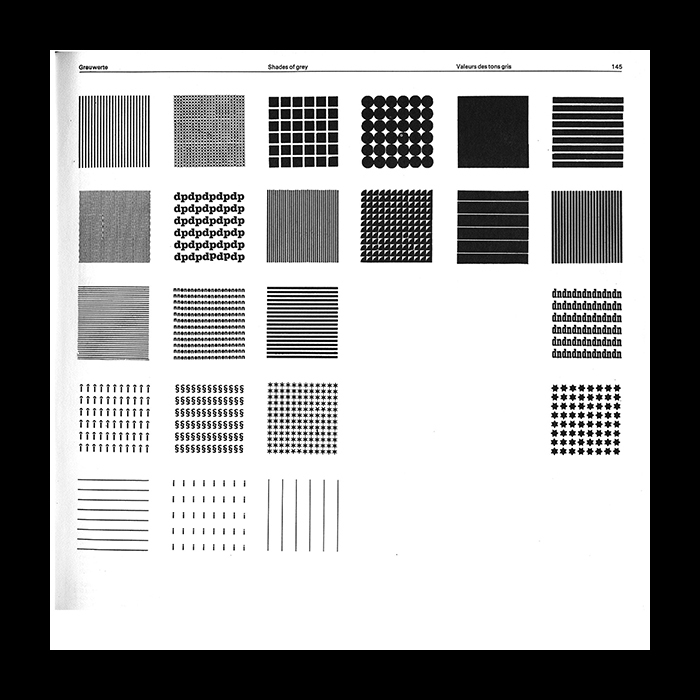 Produce a series of 25 compositions of differing gray values on an empty scanner bed by controlling the rhythm of the light which hits it. Test the full capacity of this procedure — the maximum range of variations you can produce. Print five of the most interesting and varied compositions. 2. Articulate the sections of your composition as distinct and semi-regular zones of grey. For each section, choose one letter in one typeface and in one size, which, when repeated, most closely reproduces the grey value of the scanned section. Letters must remain legible and not overlap. Use only the letters A–Z. In each section of the composition, explore the effects of type size, letter-space, and line-space. Choose three scans and make two equivalent typographic versions of eac. Print. 3. Produce a higher resolution typographic translation, in which you capture a greater degree of grays from your scanner composition. Capture as closely as possible the values of the scan. Use only one text box (section): 8 x 8 inches. Capture horizontal as well as vertical variation. Use three letters and three different weights of Univers, Make three compositions and print.